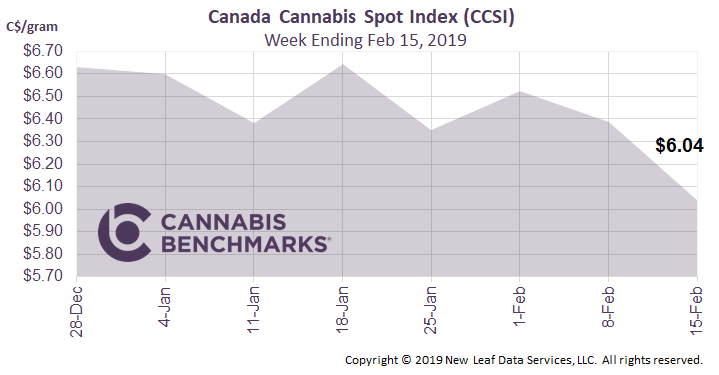 The CCSI jumped back up by 7.7% this week to C$6.51/gram, after hitting a low of C$6.04/gram last week. Last week’s price appears to be an anomaly, perhaps due to potentially lower quality and lower priced product changing hands. This week’s price mean reverted back to the 2-month moving average of C$6.45/gram. C$6.51/gram equates to US$2,232/pound at current exchange rates. 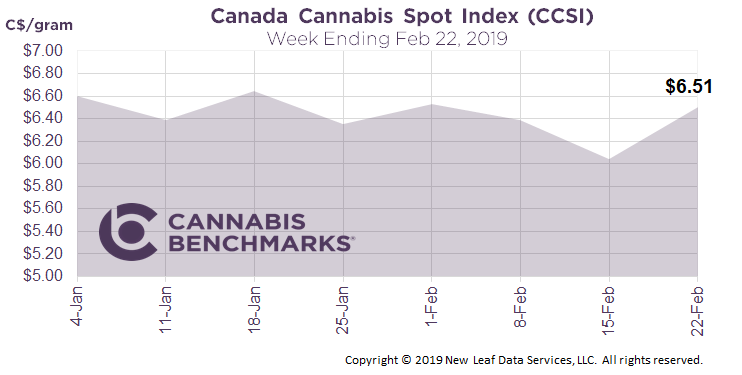 This week we dive a bit deeper in the quarterly earnings reports issued by Canopy Growth and Aurora Cannabis. The Health Canada Cannabis Tracking System report gives us complete view of both medical and recreational sales in the last quarter of 2018. 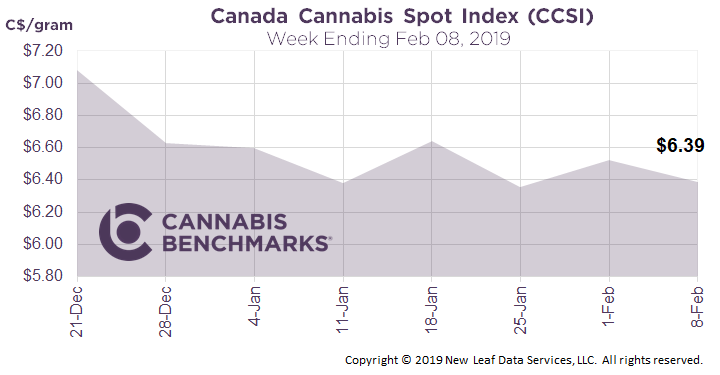 From the latest data issued on Jan 29th, a total of 40,753 kg equivalent was sold across Canada with an almost perfect 50/50 split between the medical and recreational markets during this time period. Using this data as a reference point, we calculate the reported Canopy sales volumes of 10,102 kg equivalent for that timeframe for dried cannabis and extracts to be approximately 40% and 9% of the total Canadian recreational and medical markets, respectively. Aurora, the second-largest producer, came in with a smaller market share of 20% of recreational sales, but a substantially larger share of the medical market at 16%. Both producers also gave some insight into their average net selling prices. 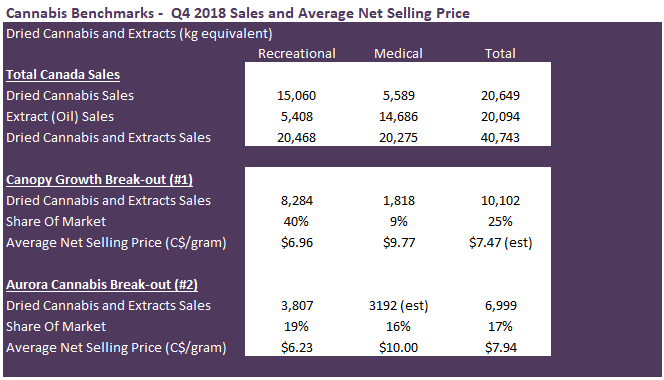 Canopy’s average net selling price for dried cannabis in the recreational market was slightly higher than our average index price over Q4, while Aurora’s was more comparable to our price assessments. Canopy and Aurora stated their average net selling prices (net of excise duties) to be C$6.96/gram and C$6.23/gram, respectively. The CCSI averaged approximately C$6.32/gram over Q4 2018 (net of the C$1.15 provincial and federal excise duties estimated by Cannabis Benchmarks [$C7.49 less C$1.15]). 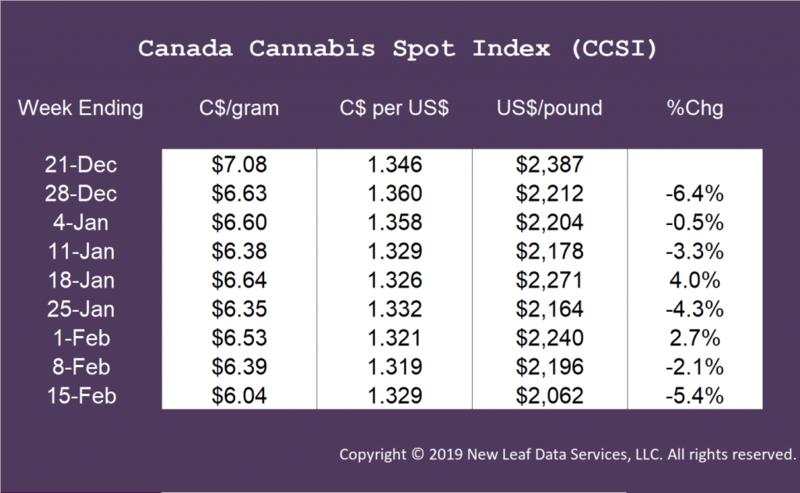 The CCSI declined 5.4% this week to C$6.04 per gram, from C$6.39 per gram. 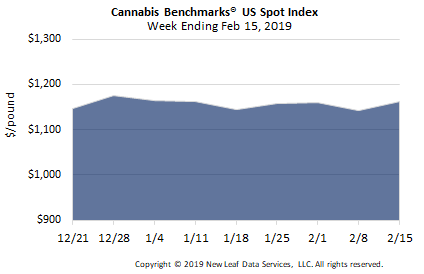 The index has moved to the lowest point since legalization. C$6.04 per gram equates to US$2,062 per pound at current exchange rates. This week we saw quarterly earnings from the two largest licensed producer, Aurora Cannabis and Canopy Growth. The earning period for both companies end Dec 31st, 2018 cover the first full quarter of legalized Canadian markets. 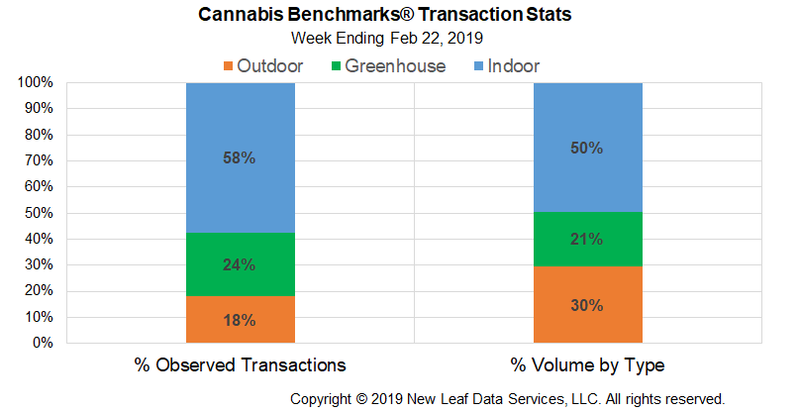 This week, we drill in to the quantity of total dry cannabis sold, and its average net selling price from the top two LPs. Canopy broke out their recreation and medical sales with the addition of recreation sales this quarter. Total volumes of dry and cannabis extract sold increased to 10,102 kg from 2,330 kg reported the previous quarter. Recreational sales made up 82% of total sales, with dry flower accounting for 62% of total sales. 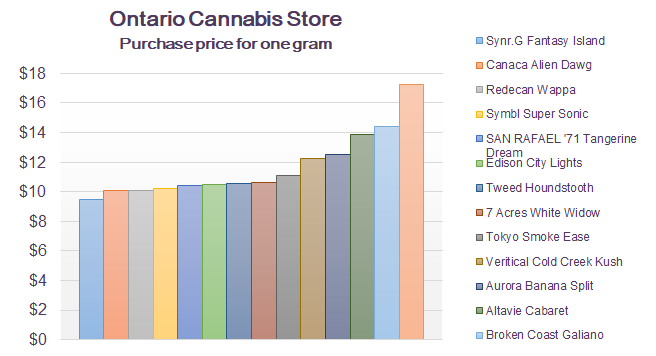 The average net selling prices for dry and cannabis extracts was reported at C$6.96/gram, while medical averaged C$8.49/gram. Aurora Cannabis kept their numbers at a higher level by lumping medical and recreational sales together. Aurora Cannabis produced 7,822 kg over the quarter with 6,999 kg sold. Digging into the Management Discussion & Analysis we managed to find total recreational dry cannabis sold was 3,500 kg and total cannabis extracts was 306 kg, suggesting that 54% of their production was sold into the newly legalized market. 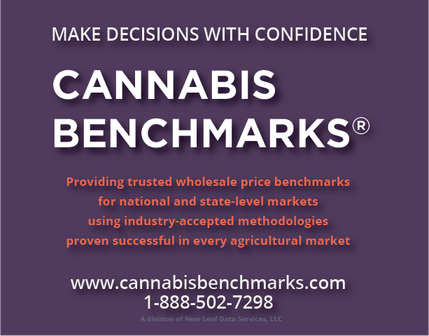 The average net selling prices for dry and cannabis extracts for both the medical and recreational markets was reported to be C$6.23/gram. 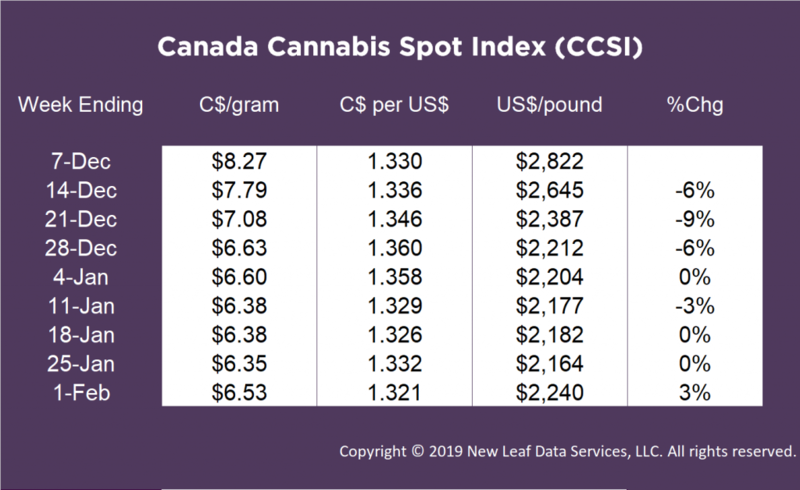 The CCSI moved 2.6% higher this week to C$6.53 per gram, from C$6.35 per gram. The index continues to fluctuate within a narrow C$0.28 range. C$6.53 per gram equates to US$2,240 per pound at current exchange rates. 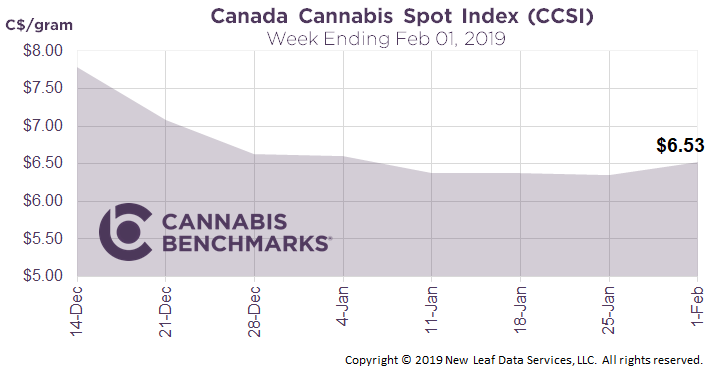 On January 29th, Health Canada released another snapshot of the preliminary data on sales, finished inventory and unfinished inventory with December 2018 included. 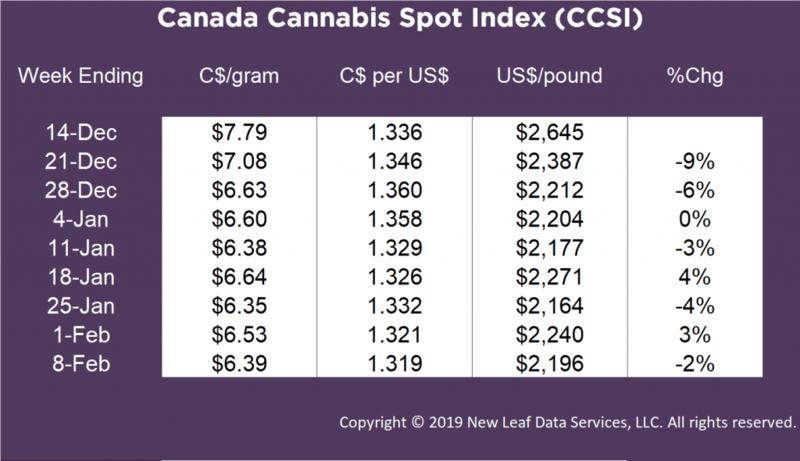 This data is released as part of the Cannabis Tracking System instituted by the Canadian government to ensure illegal supply does not cross into legalized markets. 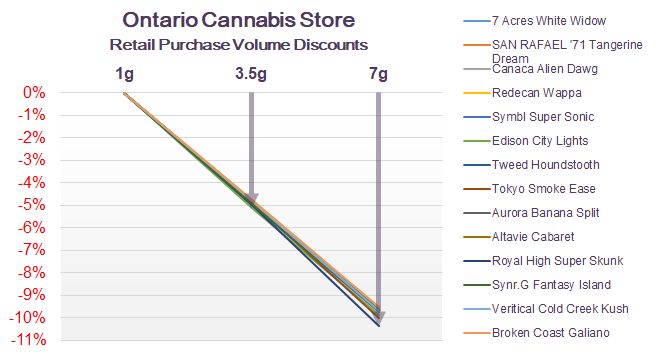 This data set is important for many reasons, but primarily to give industry participants a look at the fundamentals of non-medical cannabis sales in Canada. With three full months of operation behind us we have more data on consumer habits and inventory. Let’s start by looking at total non-medical sales. From the report we see that total recreational sales in December grew by 5% or to 7,252 kg, but that is not actually the case because December has 31 days. When we normalize for the number of days in each month, sales are essentially flat, more clearly showing Canada currently consumes approximately 232 kg per day. Next let’s look at the Inventory on hand. The reported amount of finished dried cannabis inventory, or product that is ready of sale, as of the end of December was 19,085 kg, or 2.7x the total dried cannabis actually sold on average during November and December to medical and non-medical customers. Perhaps more thought provoking is the December end of month unfinished dried cannabis inventory, or product that has been cultivated but not packaged or labelled. 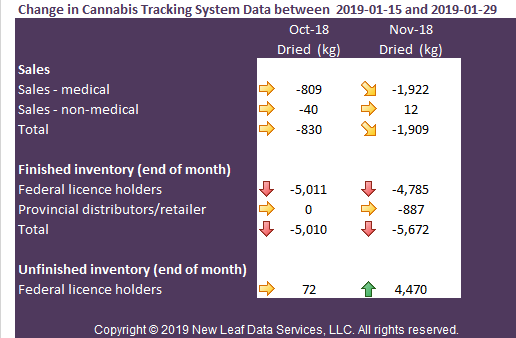 This inventory sits at 109,236 kg of dried cannabis or 15x the total dried cannabis actually sold on average during November and December to medical and non-medical customers. Lets ask the same question again: Is there really a supply shortage? This dataset is released every two weeks, and its labelled as “Preliminary”; therefore we want to discuss how much the October and November data changed. The table below gives the full comparison, but in this report we focus on a couple of the big moving factors. First to note is the total medical sales in November dropped by 1,922 kg. This could be a result of a consumers that have a medical prescription procuring product from the non-medical sector. The next piece of information that has changed is the finished inventory ready for sale. The end of month volume held by Federally licensed holders dropped by 4,785 kg in November. Simultaneously, the unfinished end of month inventory held by Federally licensed holders jumped by similar amount or 4,470 kg. Our quick take is that product that was assumed to be ready for sale in fact was not quite ready. With each release of the report we will continuously assess data and highlight the changes. 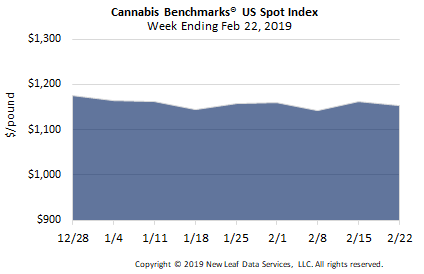 U.S. Cannabis Spot Index up nominally 0.2% at $1,159 per pound. The simple average (non-volume weighted) price increased by $3 to $1,256 per pound, with 68% of transactions (one standard deviation) in the $458 to $2,054 per pound range. The average reported deal size declined to 3.3 pounds this week from 3.4 pounds last week. In grams, the Spot price was $2.56, and the simple average price was $2.77. National Transaction Stats were very stable week-over-week to begin February. Indeed, they were virtually unchanged from the week prior. 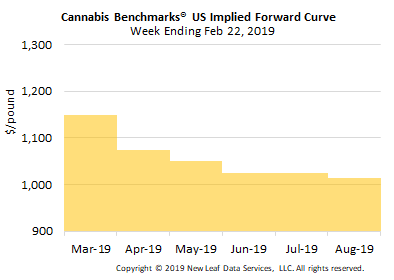 Stability in the metrics illustrated in the chart below likely stems in large part from the general abundance of wholesale flower available in the major markets, along with the maturation of adult-use systems in some of those states. With plentiful inventory and greater understanding of sales trends, buyers do not feel compelled to snap up new harvests as soon as they come down and are less likely to be caught off guard by surges in demand. The U.S. Spot Index held fairly steady this week, inching upward by $2 to settle at $1,159 per pound. 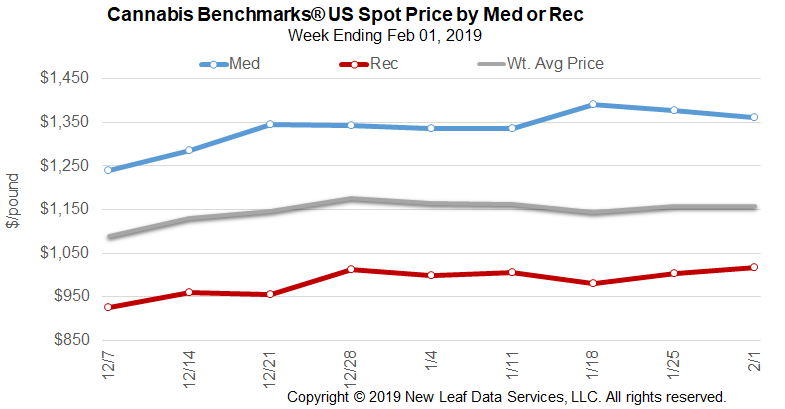 Elevated rates for indoor-grown flower in California helped lift the national volume-weighted price for such product, which buoyed the U.S. composite rate against declines in prices for sun-grown flower. 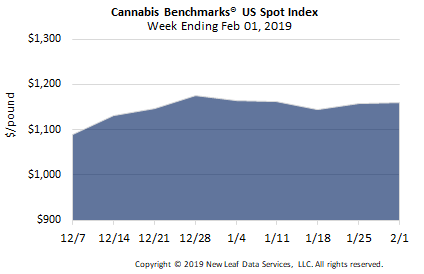 From a state-level perspective, positive trends in wholesale prices in Colorado, the country’s second-largest legal market, have been providing consistent upward pressure on the U.S. Spot Index through the early weeks of this year. Meanwhile, the newer adult-use markets of Nevada and Alaska appear as if consistent declines could be in the offing, though the opening of more storefronts and consolidation in the former later this year may disrupt current trends. 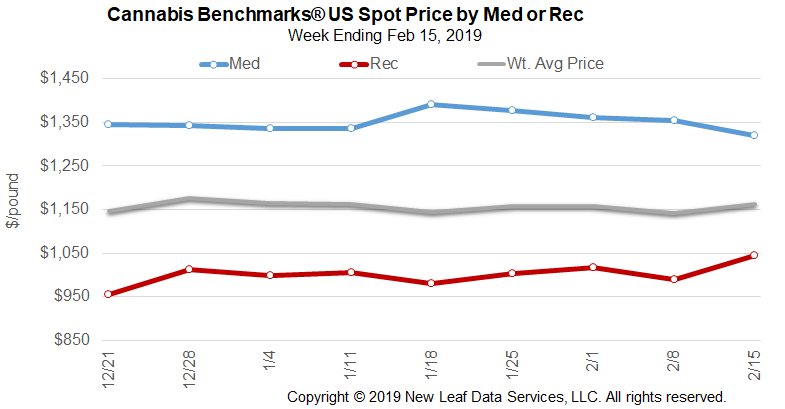 The national volume-weighted price for flower to be sold in adult-use markets increased again this week. 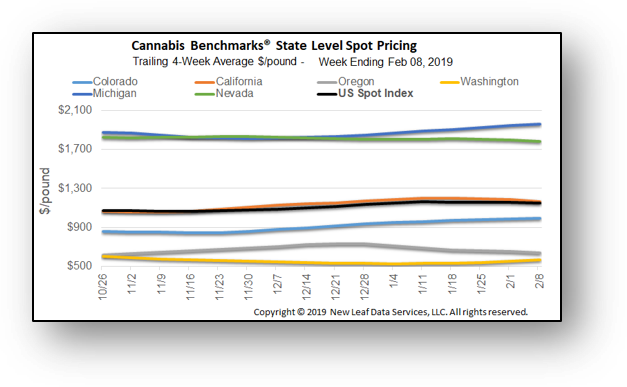 Rising rates in that sector of the market in California, as well as in Colorado, Washington, and Massachusetts outweighed declines in Oregon, Nevada, and Alaska. 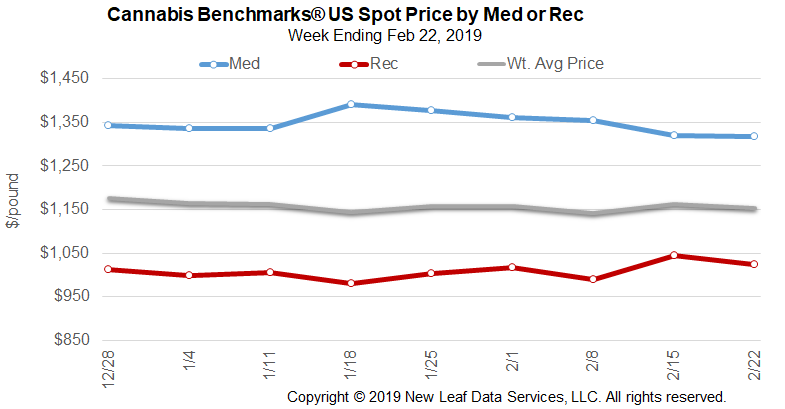 For the second straight week, decreasing wholesale rates in the medical section of California’s market pulled down the national price for product designated for registered patients recorded this week. August 2019 Forward initially assessed at $1,015 per pound. The average reported forward deal size decreased to 54.5 pounds. The proportion of forward deals for outdoor, greenhouse, and indoor-grown flower was 57%, 27%, and 16% of forward arrangements, respectively. The average forward deal size for monthly delivery for outdoor, greenhouse, and indoor-grown flower was 60 pounds, 49 pounds, and 43 pounds, respectively. The August Forward represents a decrease of 1% relative to the July Forward. 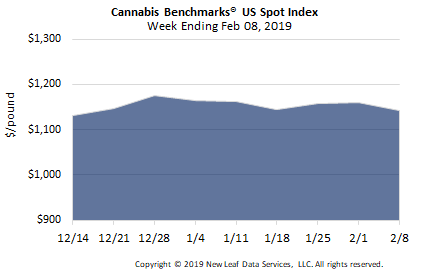 For context, the U.S. Spot Index declined 2.0% from July to August in 2017 – from $1,614 to $1,582 per pound – and by 2.6% in the same span in 2018 – from $1,147 to $1,117 per pound. 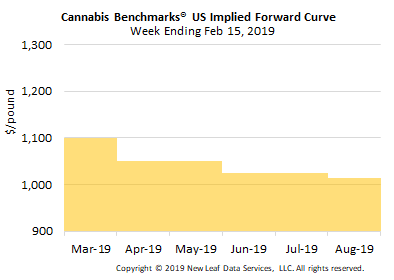 At $1,100 per pound, the March Forward represents a discount of 5% relative to the current U.S. Spot Price of $1,159 per pound. The premium or discount for each Forward price, relative to the U.S. Spot Index, is illustrated in the table below.